Jen Miller provides care for patients with pulmonary and sleep disorders in the hospital and clinic setting. 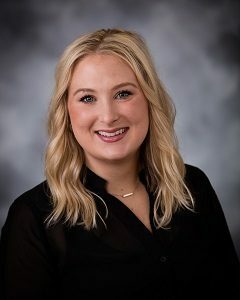 She earned her PhD, Post Masters Certificate in Nursing for Acute Care Nurse Practitioner, and Bachelors Degree in Nursing Science from the University of Nebraska Medical Center. Jen was awarded the Sigma Theta Tau International, Gamma Pi Chapter-At-Large Research Award for her dissertation study of psychometric properties of obstructive sleep apnea screening measures in patients referred to a sleep clinic. Additionally, she has published in the topics of obstructive sleep apnea screening and assessment in the primary care setting as well as sleep disorders in cancer survivors. She is a member of the American Academy of Sleep Medicine, American Association of Critical Care Nurses, and Sigma Theta Tau International. She also participates in outreach clinics at the Beatrice Community Hospital.